UWPG editor, Michael Zeigler, got a chance to take the Nikon D800 for a few dives in the new Ikelite D800 underwater housing. 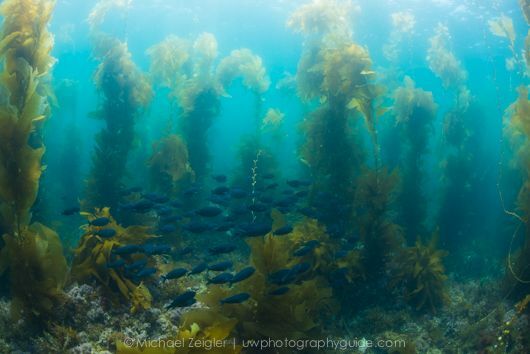 I recently had a request for some really high resolution photos of the kelp forests at Catalina Island, and the files from my 16MP Nikon D7000 weren't quite large enough. I needed to get my hands on the full-frame Nikon D800. What perfect timing! The D800 housing from Ikelite just became available at Bluewater Photo. At 36.3MP, the D800 sensor has by far the greatest pixel count of any non medium-format dSLR currently on the market, and this was certainly the camera for the job. Although conditions were less than ideal for what I was trying to capture, I was able to get a feel for the D800 and the Ikelite housing during my three dives at Catalina Island. Although I have been shooting the Nikon D7000 in the Sea&Sea housing for the past six months, I'm no stranger to Ikelite dSLR housings as I owned one with my Nikon D90. It was my first go, however, with a full-frame camera. 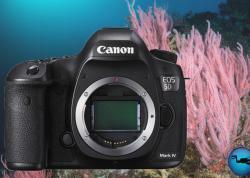 Here are my first impressions of the D800 and the Ikelite underwater housing. I managed to get my hands on the camera and the housing the evening before the trip, so I had limited time to get to "know" the camera. I was, however, able to at least set the menus similarly to my D7000. All the photos below were captured using a Nikon D800, Sigma 15mm fisheye lens, Ikelite housing with 8" dome port, and dual Ikelite strobes. 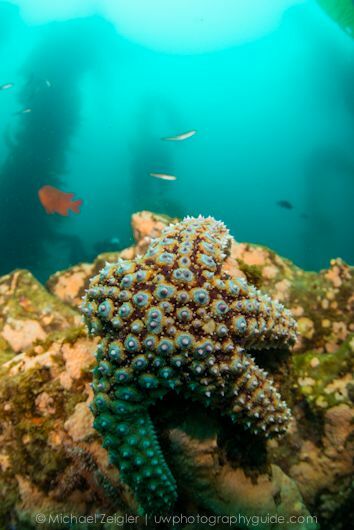 Close-focus wide-angle shot of a giant-spined sea star at Catalina Island, California. This sea star was just 2 inches from the dome port. F10, 1/160, ISO 400. Having shot the D7000 for several months now, I was surprised at how even more solid the D800 felt in my hands. I definitely noticed the weight difference too (900g vs. 780g). The controls were easy to use, and I especially liked the larger multi-selector pad. The only control I couldn't get used to was the ISO button being located on the top left side of the camera. Overall I enjoyed using the D800 for the short time I had it. The depth of field is a lot more shallow with a full-frame camera compared to that of a cropped sensor (e.g. the D7000). The above photo shows the fish in the background are out of focus, even though I'm shooting at F10 with a 15mm fisheye lens (the wider the lens, the deeper the depth of field). The difference in focus would have been much less dramatic on the D7000 at 10mm with my Tokina 10-17mm fisheye. 10mm on the Tokina with a 1.5x cropped sensor is the equivalent of 15mm on a full-frame sensor. Get a fast SD or CF card. The RAW, uncompressed files are 75MB each (7360 x 4912 pixels). The card I had for the rented camera wasn't fast enough, and I had to wait a few seconds for the images to appear for review. You can, obviously, choose to compress the RAW files in the settings, or shoot JPEG. Video is easy to shoot with the D800 via the Live View button, and a dedicated red "record" button near the shutter release. The field of view through the view finder on the D800 is 100%. No surprises in the corners of your final photograph! The multi-selector pad on the back of the camera allows for diagonal movement of the focus selector, and allows for diagonal movement of the image review. That makes it really easy to check the corners of the image for sharpness, etc. 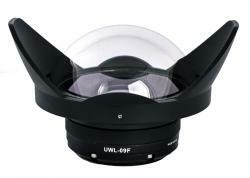 This function is not available with the Ikelite housing, but it will be with the Nauticam D800 underwater housing. The light meter was visible in the top LCD screen. I could see this being nice while using a tripod in a low position. After framing the shot you wouldn't need to kneel down to adjust the settings using the light meter in the view finder. I found that it focused just as fast as my D7000. Auto-focuses at F8 like the Nikon D4 does, great for teleconverters! It took a few minutes of slow approach along the bottom to get this close (one foot) from this bat ray. F11, 1/250, ISO 400. Publisher's note - as someone who has shot this scene many times with a D300 & D7000, I'm quite impressed by the detail in the photo, and the range of the blue color in the background! The clear, heavy-duty polycarbonate construction of the Ikelite housing made seeing the controls easy, and also allowed me to view the LCD screen on the top of the camera right through the housing. 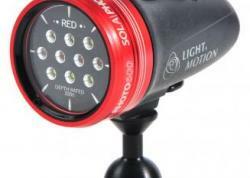 The electrical bulkhead and TTL circuitry allows for fine-tuning of strobe power via easy-to-control knob on the back of the housing. Although the housing is larger than most aluminum housings, I found it easy to control underwater. Just be sure that all the controls and knobs are pulled "out" when putting the camera into the housing, to ensure proper alignment of the controls once the camera is secured in the housing. Once secured, always be sure to fire at least one test shot (true for ALL housings) to make sure the controls are positioned correctly, the bulkhead connector is hooked up, and to make sure you didn't leave the lens cap on. Also take a test shot with your strobes on. The housing, 8" glass dome, and two Ikelite strobes were almost perfectly neutrally buoyant with just a few strobe arm floats. I really liked the dedicated AF-ON button on the camera, which I primarily use for focusing when the camera is in a housing. However, this was only available via a button the back of the Ikelite housing. I was able to program the AE-L/AF-L button for the AF-ON functionality, which was accessible via a lever that I could easily reach with my right thumb while shooting. The top LCD screen was clearly viewable through the housing, which was nice. I never had to access the "info" button to see the settings on the back of the camera. As I mentioned above, the light meter was also visible in the top LCD screen. 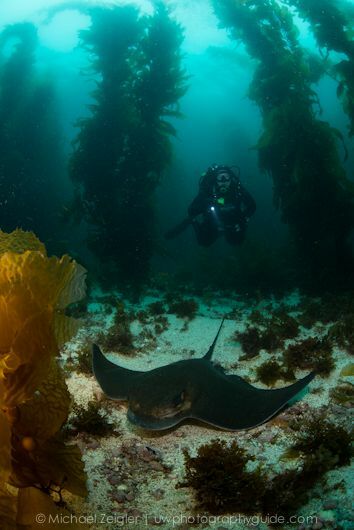 I found this to be a nice feature while I was cruising through the various light conditions of the kelp forests. I could easily look down and adjust the settings for the changing ambient light conditions. This way I could be ready for "the shot," should something interesting decide to visit. I found it a bit cumbersome to switch back and forth between AF and M modes, using the switch on the lower left side of the housing. Due to the way the camera slides into the housing, the switch is a one-way switch. In other words, in order to switch back to AF from M, for example, I needed to physically pull the control knob out, look through the housing to see where the mechanism was located, then align it was the other side of the switch. Once aligned, I could twist the knob and engage the switch to make the change. The ISO of this camera is located on the top left side of the camera body. This is accessed with the Ikelite housing via button. I highly suggest that you turn on the "Release button to use dial" setting in the Custom Settings menu of the D800. This will allow you to press the button, release the button, and adjust the setting using the main dial without having to use both hands at the same time. 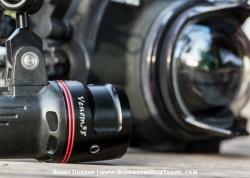 My D90 did not have this feature, and it's a great to have with the Ikelite housing. The only control that I did not have access to was the metering mode (i.e. matrix, center-weighted, spot). It is operated via a small dial, located around the perimeter of the AE-L/AF-L button. I usually leave my metering mode on center-weighted anyway, but it would be nice to access this, just in case. Just be sure it's on the setting you want before you close the housing! School of blacksmith in the shallow kelp forest of Isthmus Reef at Catalina Island, California. F11, 1/60, ISO 200. I really enjoyed getting the opportunity to use the D800 above and below the water. For use topside, the camera had some "nice to have" features that included switch to close the view finder when using a tripod, a dedicated AF-ON button, and a separate button to raise the flash (separate from the button usually used to change the flash settings). For use underwater, I still prefer my D7000. The increased depth of field comes in handy for me, especially when shooting macro or supermacro. Plus, I love the versitility of the Tokina 10-17mm fisheye, which is not compatible with full-frame cameras. Personally, I will not consider switching to a full-frame camera unless I find it absolutely necessary to produce massive prints of my work. All in all, it's a fantastic camera, and worth the investment if you use the camera to its fullest potential. The Ikelite housing is solid, and a great option if funds play a part in the decision making process. 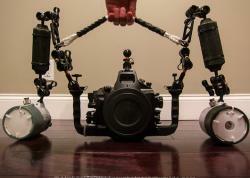 I am looking forward to getting my hands on the Nauticam D800 and Sea & Sea D800 housings as well. Need some hands-on help? The pros at Bluewater Photo are here to help! 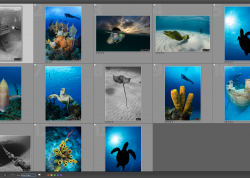 Michael Zeigler is a contributor, instructor, and trip leader for the Underwater Photography Guideand Bluewater Photo, as well as an AAUS Scientific Diver. Michael's underwater photography and blog can be seen at SeaInFocus.com.